Description: This dovesized shorebird has a long, straight, black bill and light green legs. Breeding birds are primarily light reddish-orange below with spots along the sides and underbelly and mottled buff and black above. Nonbreeding birds are dull graybrown. In flight, the white diamond pattern on the back is characteristic of dowitchers. Vocalizations are a “tututu” call. They feed by probing, often appearing stationary, in an oil pump fashion. Similar Species: Unlike Wilson’s Snipe, dowitchers do not have a striped appearance. Stilt Sandpipers are more delicate in appearance. 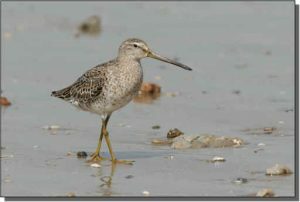 To distinguish from Long-billed Dowitchers, listen for the call and look for a flat-backed appearance (rather than rounded) and spots (versus bars) along the sides and underbelly. Short-billed Dowitchers often arrive later in the spring and earlier in the fall than Long-billed Dowitchers. Comments: Short-billed Dowitchers breed in muskegs of the boreal forest and winter primarily in coastal areas through northern South America.